Ha~ Birthday, Jolie! You're finally three! "Ha~ birthday to you, ha~ burrday to you, ha~berrday to Jolieee!" Well, today she turns three, and boy does it feel like an eternity and a flash at the same time. My little girl who loves puppies, pyjamas and Play-Doh, is growing up. 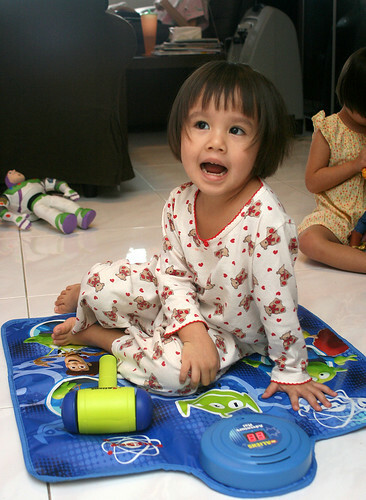 She, who used to look like a boy when she was a baby, now is recognisably a girl. 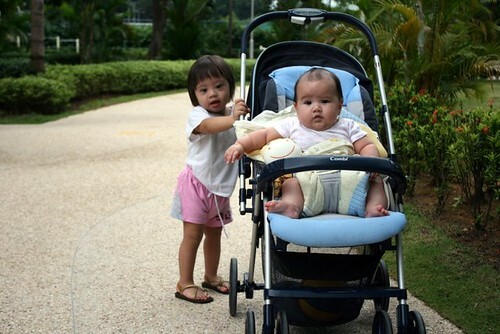 This is her (in the pram) when she was 6 months old. 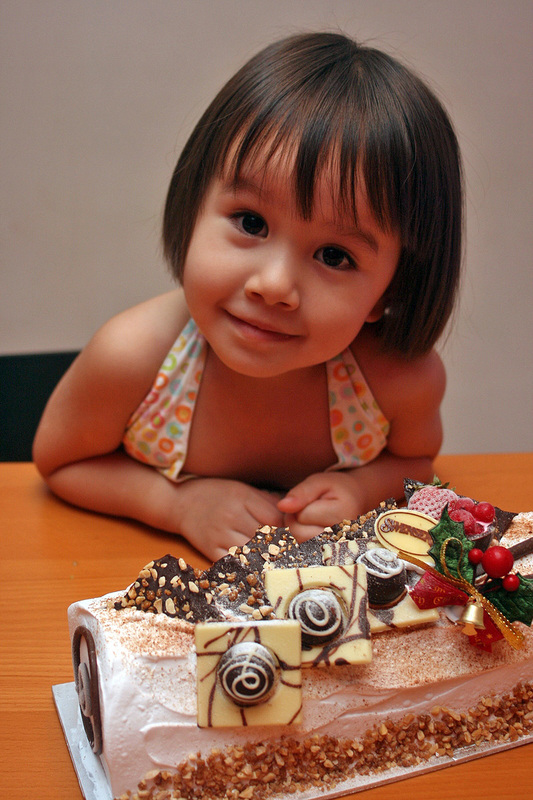 With Jolie's birthday on 17 Dec, Christmas comes early in our home, and the presents all get opened one week ahead. Ah, here's Nadine again sneakily going for the wall switch for the lights. On-off, on-off...oh the tree is brand new, and we let them decorate it with the baubles. Presents time! 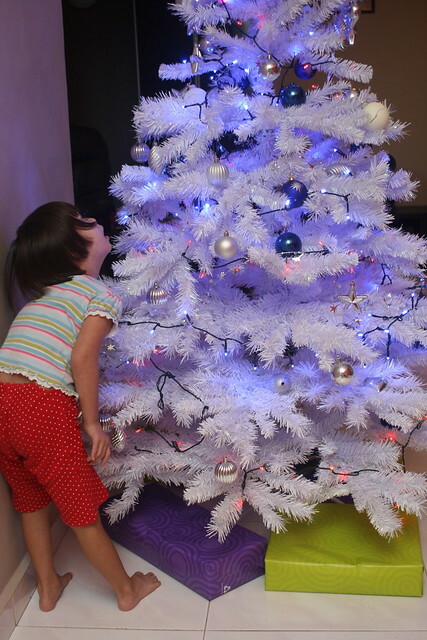 We thought we could wait til dinnertime but there is no stopping kids when they see presents. Bright and early, it was time to open the presents. Look at Jolie, barely awake yet, but shaking her gift. It was a Toy Story 3 bonanza for them. They love the movie. 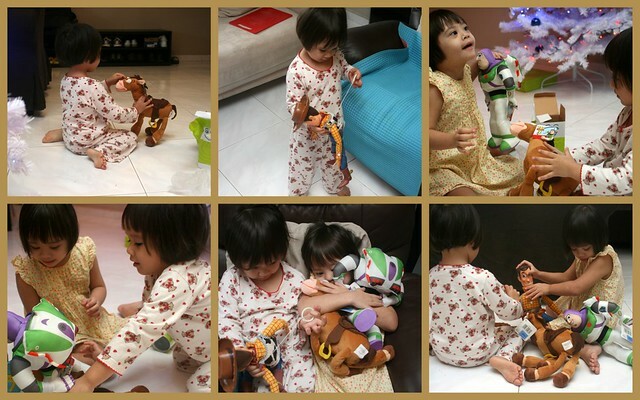 So we got them Woody, Bullseye and Buzz Lightyear dolls which they absolutely loved and hugged all day. We also got them a lenticular jigsaw puzzle and "whack-a-mole" style adventure mat. It looks like Jolie's found a way to whack all the targets at one go. 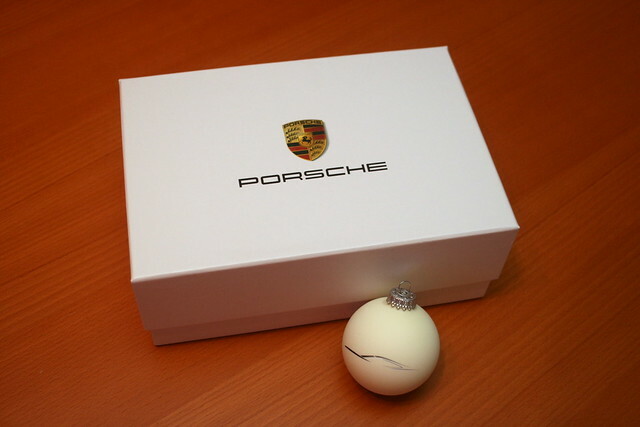 The most extravagant gift, however, came from a friend's mom who has personally benefited from using it. Thank you, Susan! 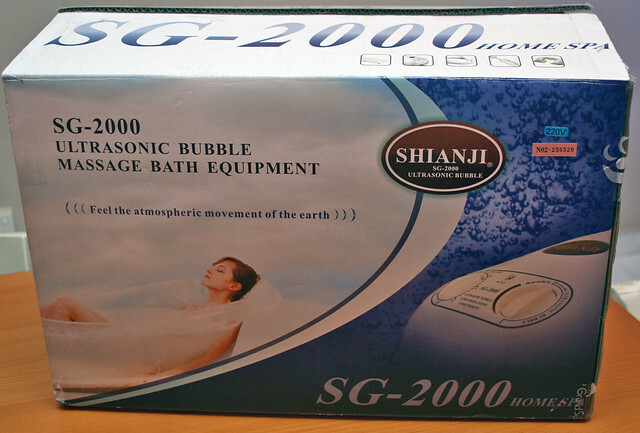 This home spa machine will fill your bathtub with ultrasonic bubbles strong enough to give you a good massage and boost your blood circulation for a good while. We put it on a gentle setting for Jolie, and she loved the bubbles! Anyone interested can email me, and I can pass you the contact (they give free trials at their office). So the kids clearly have a lot to play with. Christmas is early for them. Here's wishing all of you happy holidays and a glorious festive season ahead! Thanks, everyone! It looks like Jolie is getting the bulk of her birthday wishes on Twitter and Facebook instead of on the blog! Interesting trend! happy super belated birthday to Jolie! (= sorry, a little behind my feeds. just out of curiosity, does Jolie get only Christmas presents here, or does she get birthday presents too? Or do you instead buy presents for both kids regardless of whose birthday it is? Miachenyze: Haha sharp question. Well, both kids get presents at their birthdays, so no one feels left out. And we've stopped counting or specifying which present is for which occasion. They just get a bumper crop of goodies at year end! Ha- Birthday, Jolie! I wish you all the best in the world. You are a cutie. Lunch with Long Lost Friends! Win a Ben & Jerry's Bike on 17th Dec! TCC - is the menu an upgrade?